Recreation | MY LIFE AND LIVING WITH AUTISM. My family and me have just been to the park and then to Starbucks. first thing we did at the park was me and my brother Tom climbed down a hill at the side of this very shallow river (we was pretending to do rock climbing). We was pretending that because he might be going to a indoor rock climbing place soon in Manchester for his confidence because at the moment he is always shy and prefers to be on a computer. Then we all went on a big field where we took turns hitting a tennis ball miles into the air and the others had to catch it. It was actually a really good game and i did some great catches. It was nice to see my sister Jess joining in as well because she doesn’t like doing much exercise because she gets tired easy. It does get annoying though because when we go on walks and there’s a hill we have to turn back because she is too lazy to go up it. When it was time to go my brother Tom had a quick go on the climbing frame and swings and then we went. After the park we went and got one of my all time favorite drinks from Starbucks (i know Starbucks is very expensive but it was a one off). It is called a chocolate creme. 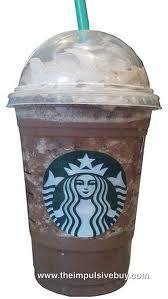 Basically it is like a hot chocolate but cold with crushed ice in it and creme at the top (optional). I highly recommend one of these drinks they are delicious. When we got the drinks from the drive-through at Starbucks we went for a nice drive through the hills. I loved it because it has been about 25 degrees today here in Bolton ( it rarely goes above 20) so it was great to get a nice cold drink and cool off as we drove through the hills. Its been a great day.